Its when your bubs head starts to move down into the pelvic brim in preparation for childbirth. It can happen at any time throughout the final weeks of pregnancy right up until the beginning of labour itself. How Will I Know When Bubs Engaged? During the last weeks of pregnancy, often at your scheduled midwife or obstetrics appointment, your care provider will palpate your abdomen to see if the head has dropped down – started to engage. The degree of how far your baby has engaged is measured in fifths. If 3 or 4 fifths of the head can be felt above the pubic bone, then the baby is NOT engaged. If only 2 fifths of the baby’s head can be felt, the the baby is said to be fully engaged. If just 1 fifth of the baby’s head can be felt, the baby is recorded as being deeply engaged. You will feel lighter, in that your breathing will become easier, with more room for your lungs to expand. Your abdomen may also seem smaller and your bump shifting down and forward as your baby’s head enters the birth canal. With so much more pressure on your bladder, you may need to go to the bathroom more frequently. You may also experience some pelvic pain or sharp nerve pain as your baby pushes down into the pelvis. It’s important once your baby is engaged that if you are experiencing any pain or discomfort that you try not to stand for long periods of time. Sitting on an exercise ball can be very helping in reducing pain and helping the baby shift down into the birth canal. In preparation for labour, you should be aiming to strengthen and tonify your uterine muscles which will help you to have more effective and efficient contractions. You can easily do this naturally with our birth preparation blend – CapaciTea. Its a Raspberry Leaf blend that’s recommended by midwives around the world for women to prepare for childbirth during the third trimester. Our Naturopaths recommend enjoying 1 cup a day from 27 weeks then gradually increasing to 3-4 cups a day by 35 weeks. 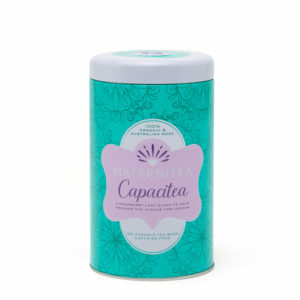 CapaciTea is 100% organic, caffeine free and comes in convenient pyramid tea bags.